There once was a weary traveler who longed for several consecutive days of vacation. They were out there, scheduled and waiting, for her to seize the day. But first, there was one last business trip for 2008 and she thought, well, the best part about it was that she was going west and south... Phoenix, to be exact. A little sunshine and desert in the dregs of winter never hurt anyone, she knew, and could do lots to chase away the gray Kentucky winter doldrums. So the traveler traveled and watched the Weather channel as her coworkers were headed to places like Kansas where there was a snow and ice storm, and thought about her family back home, who were in the midst of another snow and ice storm. But she was headed to sun and sand and perfect 70 degree winter weather. Yes. Rain. And lots of it! So why was she concerned and a bit annoyed that there was no sun and 70 degree weather? 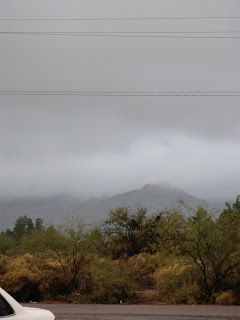 It doesn't rain like this in Phoenix. Not that often anyway. And well, it was gray. Like home. And she was looking forward to sun. But at least, she reasoned, it is not snow and ice. The weary traveler supposed she should be thankful it was not snow and ice for there was plenty of that north elsewhere in the country and even in Arizona that week. 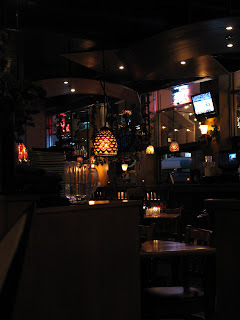 So what better on a rainy evening, she thought, to tuck into a nice restaurant for a great Greek dinner? So that was exactly what the weary travler and her friends decided to do. It didn't take them long to decide. 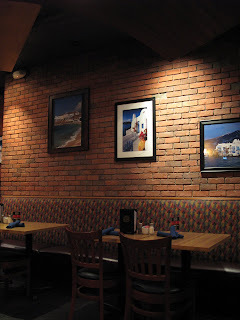 My Big Fat Greek Restaurant sat on Mill St. in Tempe near the Arizona State University campus and it always was a treat. The traveler, quite fond of Tempe and its funky Mill St. downtown, knew the restaurant would fit her mood this evening. She settled in with a warm cup of Earl Grey and took in the ambiance while waiting for her friends who were shopping and getting haircuts. 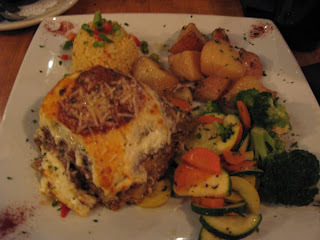 ...and the supersized Mousaka, it would seem. And she was, well, quite pleased, for the food was hearty and scrumptious on this cold and rainy day... and double-treat, there was plenty enough food left for lunch the next day. 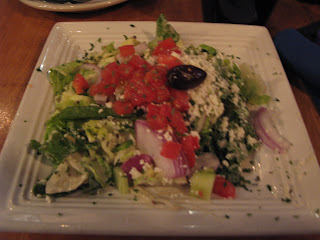 And the weary traveler was glad for a little rain in Phoenix and the warm and cozy Greek restaurant and the company of her friends. Oh, and the Earl Grey.